Are you looking for a great steel drum band for your Melbourne beach wedding, or your next Melbourne corporate event? Do you want entertainment that is appropriate for all ages, and of course something for your guests to remember? 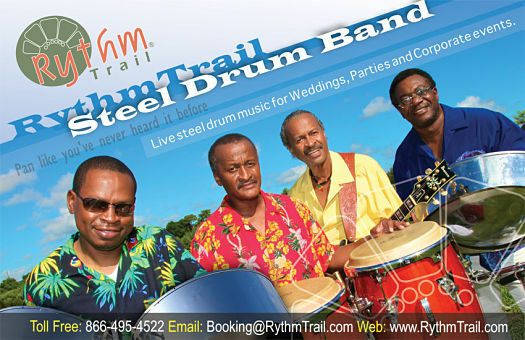 The RythmTrail steel drum band has over 20 years of music event experience. They know just how to give the performance you are looking for and if you want to provide the song list they are fine with that too. Pick out your own romantic, or upbeat songs. And listen to what you want to hear. RythmTrail provides entertainment in Melbourne and all around the state of Florida. They also handle entertainment nationally and internationally for your convenience. If you are at Indian Harbour Beach, Melbourne Village, Palm Bay, or even Satellite Beach they can provide you with the best steel drum players to make your event spectacular. If you want a single steel drum player, or the whole band they can accommodate you. They specialize in Reggae, Soca, or Calypso making it the greatest Caribbean music entertainment you have experienced. And to assist you even more the RythmTrail steel drum band is just a click or call away. If you are looking for your next event you can call (866)495- 4522 or visit them online right now to get your quote now. Booking questions? That’s not a problem RythmTrail Steel Drum Band can help you with any questions you have on the process, prices, and entertainment options. Don’t miss out on this great opportunity, and get the best Caribbean music entertainment you can get any where in the world brought right to you and your guests. RythmTrail loves to Entertain and want to be part of your upcoming beach wedding, corporate event, or even your very own house party. Contact them today!